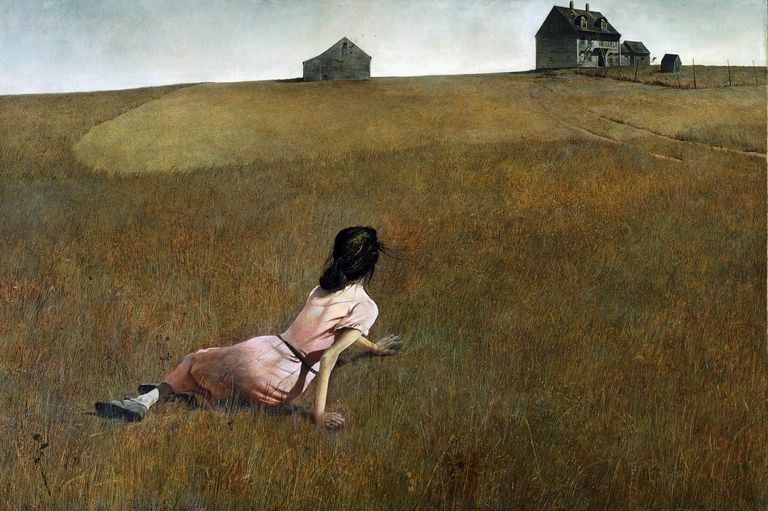 Andrew Wyeth painted "Christina's World" in 1948. His father, N.C. Wyeth had been killed at a railway crossing just three years earlier, and Andrew's work underwent a significant change after the loss. His palette became muted, his landscapes barren, and his figures—if present—seemed plaintive. "Christina's World" epitomizes these traits and conveys the impression that it is an outward expression of Wyeth's inner grief. Anna Christina Olson (1893–1968) was a lifelong resident of Cushing, Maine, and the farm where she lived is pictured in "Christina's World." She had a degenerative muscular disorder (undiagnosed but sometimes identified as polio, though it may have actually been Charcot-Marie Tooth disease) that took away her ability to walk by the late 1920s. Eschewing a wheelchair, she crawled around the house and grounds. Wyeth, who had summered in Maine for many years, met the spinster Olson and her bachelor brother, Alvaro, in 1939. The three were introduced by Wyeth's future wife, Betsy James (b. c. 1922), another long-term summer resident. It's hard to say what fired the young artist's imagination more: the Olson siblings or their residence. Christina appears in several of the artist's paintings. There are three models here, actually. The figure's wasted limbs and pink dress belong to Christina Olson. The youthful head and torso, however, belong to Betsy Wyeth, who was then in her mid-20s (as opposed to Christina's then-mid-50s). The most famous model in this scene is the Olson farmhouse itself, which was built in the late 18th century, and is still standing and was listed on the National Register of Historic Places in 1995. The composition is perfectly asymmetrically balanced, though parts of the farmhouse were rearranged by artistic license to accomplish this feat. Wyeth painted in egg tempera, a medium that requires the artist to mix (and constantly monitor) his own paints but allows for great control. Notice the incredible detail here, where individual hairs and blades of grass are painstakingly highlighted. The Museum of Modern art opines, "In this style of painting, known as magic realism, everyday scenes are imbued with poetic mystery." The Art Story.org quotes the artist himself describing Christina's World as ​"Magic! It's what makes things sublime. It's the difference between a picture that is profound art and just a painting of an object." "Christina's World" was met with little critical notice after its completion, mainly because (1) the abstract expressionists were making most of the arts news of the time and (2) the founding director of the Museum of Modern Art, Alfred Barr, snapped it up almost immediately for $1,800. The few art critics who commented at the time were lukewarm at best, deriding it as "kitschy nostalgia," wrote Zachary Small. During the ensuing seven decades, the painting has become a MoMA highlight and is very rarely loaned. 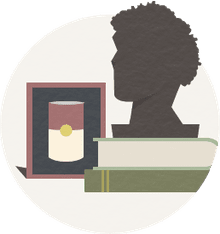 The last exception was to an Andrew Wyeth memorial show at the Brandywine River Museum in his native town of Chadds Ford, Pennsylvania. More telling is how large a part "Christina's World" plays in popular culture. Writers, filmmakers, and other visual artists reference it, and the public has always loved it. Forty-five years ago you would have been hard-pressed to find a single Jackson Pollock reproduction within 20 square city blocks, but everyone knew at least one person who had a copy of "Christina's World" hanging somewhere on a wall.